Having had rescue whippets when we first got married, and when our children were young, we took a break from having dogs when the kids grew up and both my husband and I were working full time. In 2012 my life changed when an accident left me with spinal cord damage. Without going into detail, it would be an understatement to say it was a very low point in my life. My husband worried everytime he left me alone to go to work, and as I could still walk short distances (and we had a field behind our house) he suggested we get a dog to keep me company. There was only one dog for us, so for the first time we got a puppy rather than an adult dog. I can honestly say he probably saved my life. Instead of feeling that I was the one needing to be looked after, I had this tiny scrap of cuteness to take care of. I went to puppy classes with him and walked him (which meant I left the house!) toilet trained him, and most importantly, got unconditional love. He didn't see my disability, so I began to see it less, and to feel useful again. He's 5 and a half now. Mischievous, loving and a very handsome chap who just wants to be friends with everybody and other doggy playmates. His 'Daddy' takes him for long runs, and he still likes to cuddle up with me on my chair. 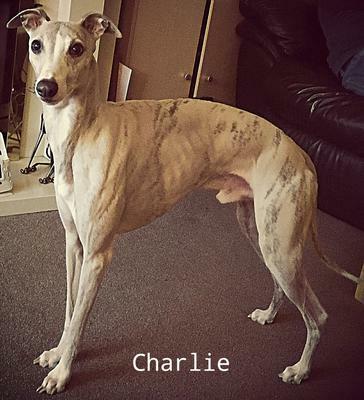 Just saw the photo of Charlie and I felt I was looking at my whippet Decker. They have the same face and markings. Absolutely beautiful. I understand you completely. 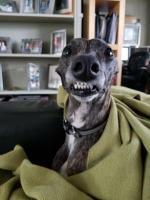 My whippet was my lifesaver too!